Espresso, chocolate and ice cream in one dessert – need I say more? Just 5 minutes or less to make this yummy Belgian Iced Coffee Cream! Today, just before the clock strikes midnight, our family is off to Europe! We are all very excited, indeed! My husband Mark is English so every other year we go to England to visit his parents. While there we make it a point to cross over the continent so we can visit a few countries and enjoy not just the people and their culture, but of course, their food….glorious FOOD! So just before I place the few bits and pieces of stuff into my luggage and take off, I thought I’ll publish this post. After all it’s quite appropriate as it’s a European dessert – Belgian Iced Coffee Cream (Cafe Liegeois) – and something that makes me giddy excited about this trip! 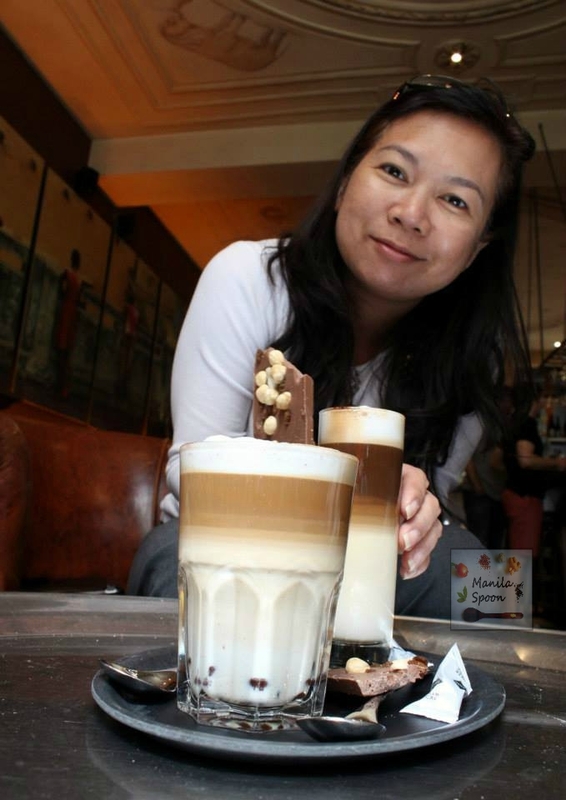 That’s me back in 2013 in a cafe in Brussels enjoying this most delicious coffee with a delightful chocolate surprise at the bottom! Apart from their chocolate and waffles, I am totally in-love as well with Belgian coffee – for a coffee lover like me – it was coffee heaven to enjoy the various types of coffee delicacy they had. This famous Belgian Iced Coffee Cream (Cafe Liegeois) dessert actually doesn’t require a strict recipe as it’s so easy to make and certainly so adjustable to one’s preference. What I’ll write below are the ingredients and a guide as to how I make it based on how I like it to taste. First you really need a good Espresso! Thankfully, I live in an area where I am surrounded by 3 amazing Italian delis so I just purchased individual shots of espresso. And after that, it’s simply a matter of mixing it all together (the ice cream should be softened a little for easier mixing). You can either mix by hand, use an immersion blender or if you wish it to be more like an ice cream again – churn it once more in an ice cream maker. Either way, they’re all good. Look at all that yummy chocolate sauce! Chill 4 small glasses or bowls in the freezer while readying the other ingredients. Divide the ice cream (2 scoops each) into the 4 glasses or bowls. Pour over equal amounts of espresso on each bowl (depending on how strong you want it – between 1-2 teaspoons is suggested or to taste.) Follow it with the chocolate sauce and the heavy cream, evenly dividing the cream and chocolate sauce among the bowls. Mix by hand or use an immersion blender. If it looks quite soft, simply place in the freezer for 10 minutes or so to harden a little or you can enjoy it right away! Garnish with chocolate shavings just before serving, if desired. First off I love Belgium. Second of all I love this recipe!!! Expresso, vanilla ice cream and warm gooey chocolate…you wrapped it all up in one neat little glass for me! WOW!! I, too, am a coffee lover. This looks amazing and I cannot wait to make it. I regret never visiting Belgium when I lived in England for a few months. Enjoy your European vacation! This looks absolutely delicious! I am such a coffee lover! I look forward to giving this a try. Hope you enjoy it as much as we do! Thanks Renee! If you love coffee-flavored ice cream you will love this Sara! Thanks! Oh my! This looks so good. You had me at coffee! Oh wow! This looks so sinfully delicious! I fully agree but so worth all the calories Jenn! I am a bit coffee lover, so this makes me very happy. It looks so delicious and indulgent. Have a fabulous trip! I'm a huge espresso person, so these iced coffee cream cafes look amazing!